igus Inc., manufacturer of engineered plastic components for a wide range of industries, will be showcasing a variety of solutions for a multitude of applications at the upcoming IMTS 2014 trade show in booth 5677 in the East Hall of Chicago’s McCormick Place. At IMTS, igus will have on display a number of industrial solutions, including their e-spool and Triflex RSP Energy Chain Systems, DryLin E motorized linear systems, and heavy-duty PRT slewing ring bearings, all extensively tested in the igus test lab for reliability to lower customer maintenance and downtime. 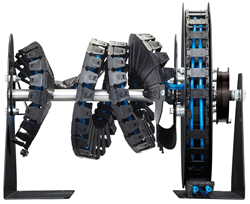 The e-spool system connects two different energy supply systems in one system – a standard energy chain guided by a reel that always supports the proper length and tension of the energy supply system, and an igus TwisterBand that performs rotational movements. This design allows movements in any direction, making it suitable for a number of fields of application. For energy supply on robotic systems, igus is offering the Triflex RSP, which supplies continuous adjustable retraction force for the Triflex multi-axis cable carrier system. Using maintenance-free, self-lubricating linear guides, the RSP system is a slim, open system which allows for both lightweight, open-style chains, or heavy-duty closed styles. Also on display will be the new DryLin E, or ‘Electric’, system, a ready-to-install linear axis with motor. A lightweight design with choice of belt or lead screw drive, and a variety of motors, this new system is custom-built and shipped in 3-4 days in 15 variations. igus’ polymer slewing ring bearings, which use self-lubricating, low-friction sliding elements in place of ball bearings, will also be out for demonstration at IMTS. Available with a variety of options, like gears and optional stainless steel versions, they are light weight and low cost, yet rugged and durable enough for even the toughest rotary applications. To schedule a visit with an igus representative at the show, or to learn more about IMTS, please visit http://www.igus.com/Fairs.